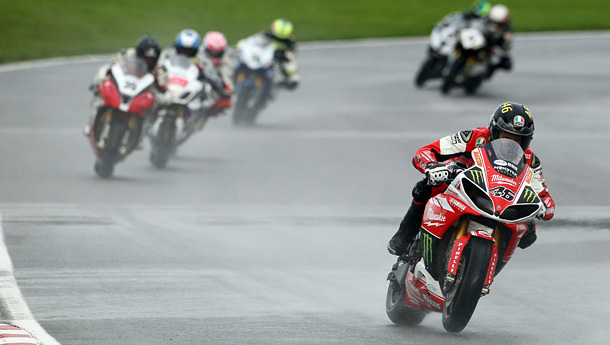 Josh Brookes started from pole position for the final title-deciding MCE Insurance British Superbike Championship at Brands Hatch over the weekend. Nothing short of brilliant riding saw the Tyco Suzuki rider take out all three races. Samsung Honda’s Alex Lowes celebrated a maiden MCE Insurance British Superbike Championship title win for Samsung Honda as he made history to become the youngest winner of the crown after finishing ahead of Shane ‘Shakey’ Byrne. BSB British Superbike Champion, Alex Lowes. Brookes took the honours in tricky conditions in the opening race at Brands Hatch as Alex Lowes moved to the top of the MCE British Superbike Championship courtesy of a gritty ride to second place. An incident-filled second race left the title fight wide open ahead of the last race of the season with Alex Lowes and Shane ‘Shakey’ Byrne dramatically crashing out as Josh Brookes claimed a sensational win from Halsall Racing Kawasaki team’s Lee Costello. Brookes was again victorious as he made it a hat trick of victories for Tyco Suzuki as he edged out an advantage on track leading from the start. 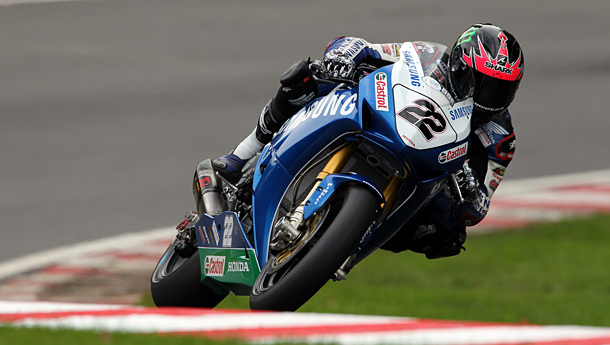 Alex Lowes finished second after a drama packed race with Rapid Solicitors Kawasaki rider Shane Byrne. Brookes broke clear in the early stages of the race and although Samsung Honda rider Lowes began to close on the last lap, the Australian followed up his pole position with a calculated victory on the GSXR-1000 to take the win by 0.968s after 18 laps. 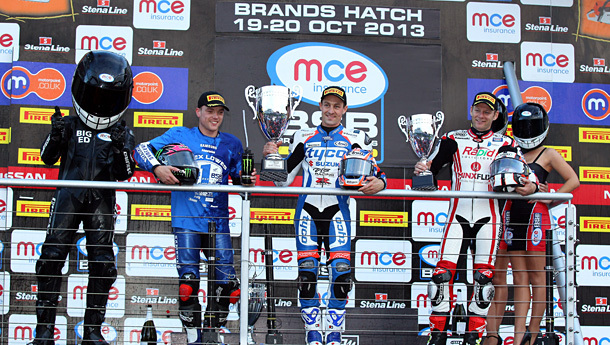 On the podium in Race 1 L-R Alex Lowes second, Josh Brookes first, Shane Byrne third. Rapid Solicitors Kawasaki rider Shane ‘Shakey’ Byrne claimed the final pace on the rostrum but lost the title lead to Lowes, who now has three points in hand ahead of tomorrow’s final two races. Josh Waters claimed his best finish in the series with fourth place on the Halsall Racing Kawasaki, with PJ Jacobsen (Tyco Suzuki) and the hard-charging Tommy Bridewell on the Milwaukee Yamaha completing the top six. On a greasy track, Byrne powered into the lead from the start but was quickly overhauled by Brookes and Lee Costello, with Lowes fourth. Brookes eased away from the field, with Lowes passing Costello to move into third behind Byrne. The top three soon opened a huge gap at the front, as Waters overhauled his team-mate to move into fourth. Josh Waters now riding with Halsall Kawasaki claimed his best finish in the series with a fourth in race 1 and eighth in race 3. Brookes’ lead at half-distance was more than three seconds from Byrne, who was now falling into the clutches of a determined Lowes. With a dry line beginning to appear around the circuit, Lowes began to have a look at Byrne and finally made his move on lap 14 at Graham Hill Bend. Byrne had no answer to the pace of his title adversary and settled for a safe third place, while Lowes set about reeling in Brookes. 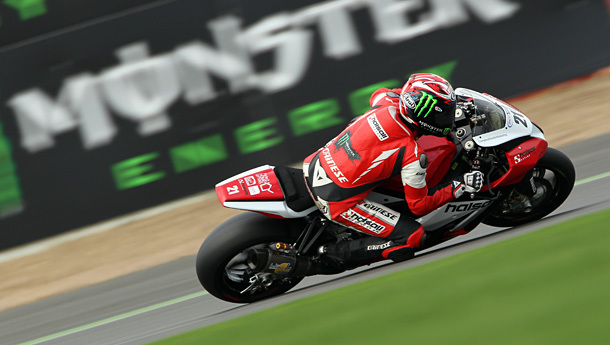 The Honda rider set his fastest lap of the race as he reduced the deficit to the long-time leader to around one second, but in the end he ran out of time and Brookes closed out the victory. Brookes claimed the race two win after his tyre choice paid off in the second race of the weekend, closing down an earlier 15 seconds gap to the leaders before mugging Costello and Ellison of the positions on the final lap of the race. Byrne hit the front early. however as the pack streamed up to Druids James Westmoreland had pushed the Buildbase BMW to the front of the field. Drama started early for standings leader Alex Lowes as he crashed his Samsung Honda on the exit of Druids on the opening lap, leaving him dejected. 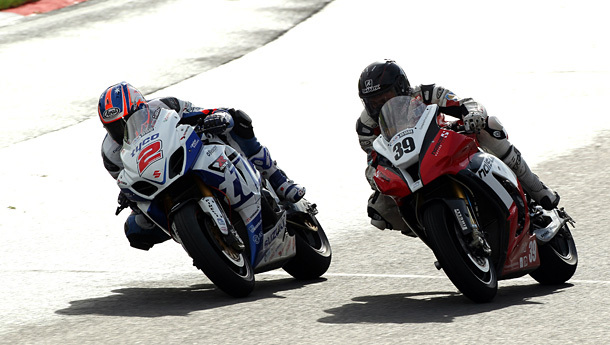 Josh Brookes and Lee Costello (39) doing battle in race 2. Ellison was holding the lead until he ran wide at Druids on the fifth lap and he rejoined in third as his Milwaukee Yamaha team-mate Tommy Bridewell crashed out unhurt at Druids. Byrne was down in ninth as the track conditions continued to change but the Rapid Solicitors Kawasaki rider dramatically slid out of contention at Druids a lap later. Brookes was taking advantage of the track conditions closing in on the lead pack; the Australian had been as far as 15 seconds adrift in the early stages of the race but he soon pushed himself into contention. Ellison moved into the lead on the fifteenth lap, pushing Costello to second, but the Halsall Racing Kawasaki rider fought back to reclaim the lead. The leading pair though had been sensationally closed by Brookes and the Tyco Suzuki and it came down to the final lap of the race to decide the podium. Costello held on to second to claim his first podium position in MCE BSB and to equal the Halsall Racing Kawasaki team’s best result with Ellison completing the podium line up. Brookes said: “I had intermediate front and rear for the race although we left the pits with wet tyres to the grid as that was the safest option and then you can check the track. It wasn’t dry but there were quite a lot of dry areas so under normal circumstances, eight laps into the race it could be fully dry. This weekend I thought the track hadn’t been drying so quickly so what wouldn’t normally be a gamble became a gamble. I know I am not in it for the championship and the two guys either side of me on the grid (Lowes and Byrne) were pretty stressed so I thought I would go with what I want to do and that was to ride on intermediates. Josh Brookes was again victorious as he made it a hat trick of victories for Tyco Suzuki as he edged out an advantage on track leading from the start, but all the drama was between Lowes and Byrne. On the opening lap Byrne carved his way through from the eighth row to be running seventh on the fourth lap with Lowes in fourth. Tommy Bridewell (Halsall Racing Kawasaki) finished fourth in race 3.